The third book in Clarke's beloved Space Odyssey series, 2061: Odyssey Three returns to Heywood Floyd, survivor of two previous encounters with the mysterious monoliths and the alien intelligences behind them. Floyd is chosen as one of a handful of celebrity guests to witness the first manned touchdown on the surface of Halley's Comet on the privately-owned spaceship Universe. But the touchdown is not fated to go as planned. On Jupiter's moon Europa, which has undergone a transformation after events at the end of 2010: Odyssey Two, scientists have spotted the sudden growth of a gigantic, asymmetrical mountain determined to be one single enormous diamond-a fragment of Jupiter's core. The Universe's sister ship, Galaxy, is hijacked and forced to crash into Europa's ocean-and the Universe is diverted from its original mission to rescue the crew. In this book, Heywood Floyd must once again survive an encounter with HAL, David Bowman, and the mysterious monolith-building race with its own hidden agenda-that will shape the destiny of the human race. Having recently found myself in need of the comfort of an old escape - one of my favourite authors during my teens and early years 20's) I revisited the Space Odyssey series. I had purchased it months ago in digital format as a set upon discovering that the final book, 3001 had somehow escaped my notice! I have now zipped through the second and third books as I could hardly put them down. I'm once again reminded of the skill with which Clarke manages to captivate even though some of the content could, perhaps, be considered dry or technical. The interesting characters, fascinating problems and the all too possible scenarios make this series an absolute pleasure. Now on to the final chapter from this prescient author. I've seen some reviews that complain about this book adding nothing to the Odyssey storyline, but I'd have to disagree. I thought this book added quite a few interesting details about Haley's comet, the development of Europa, and even Ganymede (which was kind of surprising). The first Odyssey book had a straight plot that followed one guy all the way through to the end, but neither of the first 2 sequels have really done that. Sure, 2010 and 2061 follow Heywood Floyd, but it's not so much about him as it is about discovering the possibilities of the Jovian system (he just happens to be our perspective on the events). Even the fact that the author magically moved the story from Saturn to Jupiter makes the sequels feel like their own stories that happen to live in the same universe as the original. They are really not directly comparable, I think. The only reason that I didn't give this one 5 stars is because the characters themselves were not very interesting. I really didn't connect with any of them, so there was little sense of peril when things started to go badly. I just felt like a passive observer waiting for the outcome to unfold. But I could definitely see myself reading this one again later. 2061: Odyssey Three picks up with a 160+ year old Heywood Floyd - still vigorous thanks to advances in medical technology and many decades of living at 1/6th gravity on a space station - ready to undertake another adventure, this time to land on Haley's Comet as a highly visible "celebrity" passenger. Finding out his estrange grandson is a crew member aboard a similar vessel doing research in the Jovian/Lucifer system when that ship is hijacked and forced to land on Europa, Floyd and the crew of the space ship he's traveling with must come up with an ingenious method to reach Europa in time to save the crew of the downed ship. 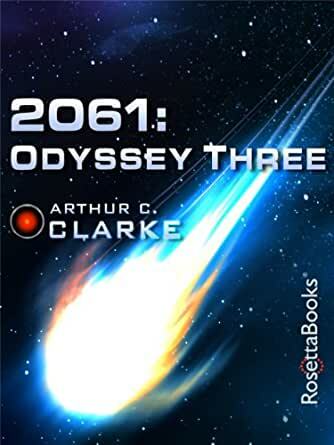 2061: Odyssey Three is a contrast to the earlier books in the 20xx universe. Where 2001 and 2010 were both fairly intense books, with a strong degree of antagonism (whether it be from a person or a hostile environment) and even a little bit of a fear factor, 2061 showcases Clarke as a master story teller - because it's only through his mastery of prose that Clarke can write a book that's almost entirely a fluff piece and still spin a tale that people want to read. To me, 2061 felt, very literally, like a group of youngsters sitting around a fireplace begging grandpa to "tell us about the time you went to Haley's comet" one more time. The fairly short novel (hardcover clocks in at 204 pages) really lacks any sort of antagonistic element, and is more a simple adventure story with a lot of flashbacks and other odds and ends. While a good story, told by a sci-fi master, I kept wanting a little more from it. The "exciting" part of the book really doesn't start until we're over 100 pages in (keeping in mind that's nearly halfway through the book), when the star ship that Floyd's grandson is a crew member on, is hijacked and forced to crash land on Europa. Fans of 2010 will remember when the obelisk/star child tells humanity "all of these planets are yours, except Europa, attempt no landings there," but when one ship crash lands there and another is sent to rescue it, the response from Europa is a bit lackluster (I wont reveal what actually happens, don't want to spoil things) and I think Clarke missed an opportunity to expand on the cryptic, otherwordlyness of that particular plot element. As others who gave the book 3 and 4 stars point out frequently, 2061 is by no means a bad book and is worth reading, but it doesn't do much to advance the 20xx universe outside of adding a little depth and detail. 5.0 颗星，最多 5 颗星As expected Arthur C. Clarke did not disappoint me . Unlike the true critics of Clarkes work , I am not one that knows science or the possibility of the science written in this book. I'm really just love science fiction. I look forward in my lifetime to see things that Arthur C. Clarke has written come to pass . I will be too old to take a space shuttle to visit another planet but it sure would be nice if my grandchildren or great-grandchildren could . As I opened the book I was excited to catch up with old friends and see what happened in their lives . I couldn't wait turn the page. I would recommend this book to anybody who enjoys science-fiction and watching the creativity of the author's mind or the impeccable research of the science. You will not be disappointed.